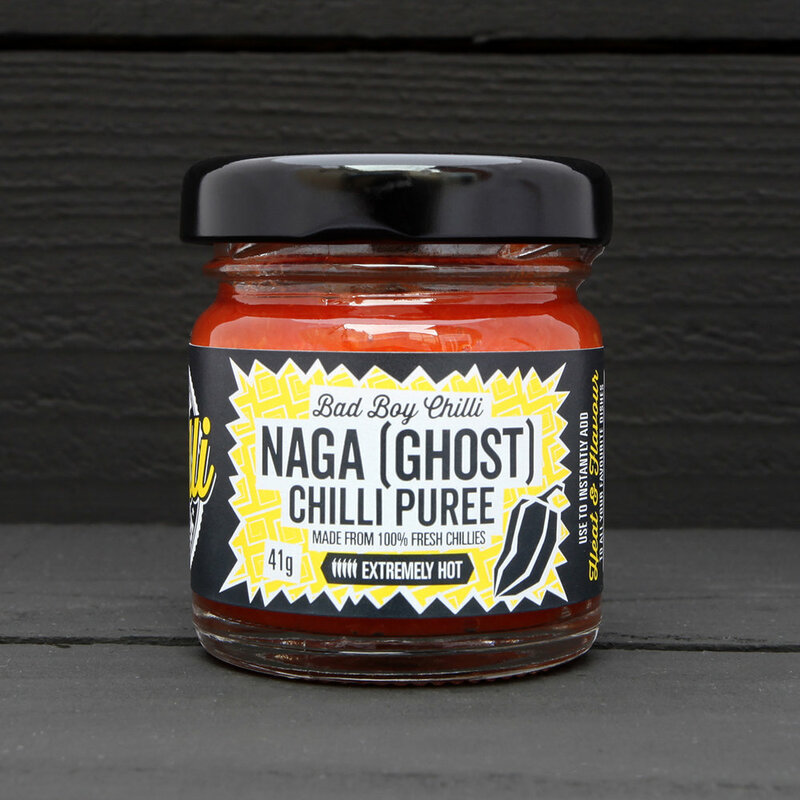 we PRODUCE AWESOME TASTING HANDMADE PUReES, USING 100% FRESH CHILLIES, A GREAT WAY TO INSTANTLY ADD HEAT AND FLAVOUR TO all YOUR FAVOURITE COOKING DISHES. WHAT CAN I USE IT IN? ...OR JUST SPREAD IT ON YOUR TOAST. This is so easy to make and is great as a side or as a snack. A great tasting salsa that is quick to make and has a fresh zingy taste. Hey, just a quick note to say that I'm loving your sauces. I bought the Bad Bay Chilli Shake which has become my staple splash and dash hot sauce (Tabasco doesn't get a look in any more). 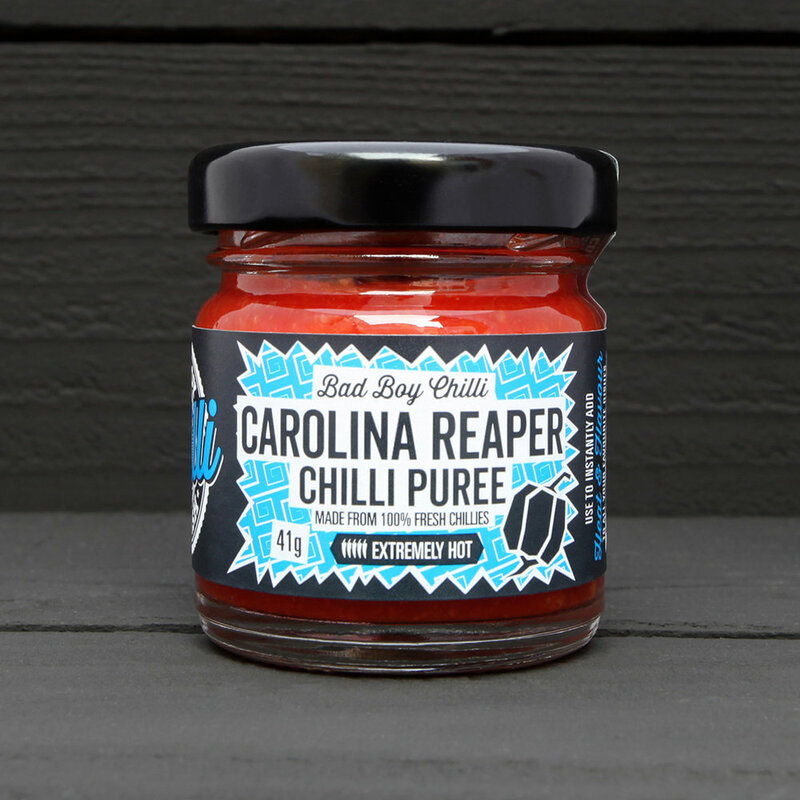 The Carolina Reaper Chilli Puree is an absolute mad man...seriously, that stuff actually makes my ears ring. Anyhow, keep up the good work, can't wait to try more of your products!!! BRILLIANT PACKAGING! AMAZING PRODUCT ITSELF! AND VERY QUICK DELIVERY! A MASSIVE WIN FOR MY PARTNER WHO LOVESSSS CHILLI! EVEN HE FINDS SOME OF THEM HOT! BAD BOY CHILLI SHAKE IS SO EASY TO USE, LOVE THE FLAVOUR AND THE KICK, WE USE IT IN EVERYTHING NOW! MY HUSBAND REALLY ENJOYS EXTREMELY HOT SAUCES AND HE REALLY LIKED THIS ONE. EXCELLENT. HIGHLY RECOMMENDED! Excellent customer service, very honest and will definitely shop again for products like this from this seller. Great Taste, the world’s most coveted food awards, which celebrates the very best in food and drink, has announced the Great Taste stars of 2018. Out of over 12,600 products to be judged, Bad Boy Chilli was awarded a 1-star Great Taste award, which means judges dubbed it a food that delivers fantastic flavour for its Kernow Gold Chilli Puree. A shake on style condiment sauce made from fresh Naga, Scorpion or Carolina Reaper chillies which gives a fantastic super hot taste and flavour which will get your tongue melting at the mouth, another favourite of ours... but use in small doses! People and Gardens was established in 1997 to assist people with learning disabilities and mental health issues to develop work and social skills to enable them to take control over their own lives. We spent a glorious weekend at the Pub in the Park in Marlow. The event was organised by Tom Kerridge and we had the pleasure of meeting the man himself who was on great form! Many thanks to Jay and Dave of the Clifton Chilli Club for reviewing our Carolina Reaper puree, these guys know their stuff when it comes to chillies.